Kimchi isn’t very common in the cities of Yorkshire. Not surprising, as there isn’t a large Korean population in these parts, but still no reason why their national dish shouldn’t get an airing. It seems to be one of those things with infinite variations, where no two batches are the same. Kimchi is, at its heart, a pickled vegetable preserve. Vegetables, typically things like Chinese cabbage, are brined in a heady mix of chilli, sugar and salt, with a little preserved seafood added to kick-start the most important characteristic of the dish. Yes, that’s right, kimchi is basically a jar full of cabbage leaves that have gone a bit funky, with lots and lots of chilli and sugar to hide that very fact. DO NOT LET THIS PUT YOU OFF. Think of it like sauerkraut instead. Kimchi is more than the sum of its quite suspect parts, and after a week or two in the fridge, maturing away, a jar of kimchi will explode with flavour, crisp cabbage leaves fizzing lightly on the tongue with a salt and sweet taste backed up by a formidable lashing of chilli. It’s one of those ‘fist in a velvet glove’ type dishes…you’ll end up on the floor, but put there gently and with some care, not just completely flattened by a massive right hook. You can make kimchi with nearly any vegetables, and there are infinite combinations and variations, but a basic, everyday kimchi is normally made with shredded Chinese cabbage. In Korea, it’s called paechu. Preparation is very simple. It’s just a case of chopping and mixing. Start with a Chinese or napa cabbage, slitting it in half, lengthways and then slicing each half across into two and a half centimetre wedges. Toss the cabbage in two tablespoons of coarse sea salt and two tablespoons of sugar and set in the fridge overnight. The cabbage will leach a lot of water in that time, water that doesn’t need to be in your finished jar. The next morning, prepare the brine by mixing together twenty finely chopped cloves of garlic, twenty thin slices of ginger, also finely chopped, four tablespoons each of of fish sauce (nam pla) and usukuchi (Korean light soy sauce), along with 48g of kochukaru (Korean chilli flakes) and two teaspoons of jarred salted shrimp. Add 50g of sugar, and stir everything around until it dissolves. The brine needs to be loose, but not too runny, so add a little water to get the right consistency. Stir in 50g of spring onions, sliced into 2.5cm chunks, and 75g of julienned carrots. Carefully tip away the water that’s been drawn from the cabbage overnight, and add the brine, stirring thoroughly until all of the cabbage is covered. 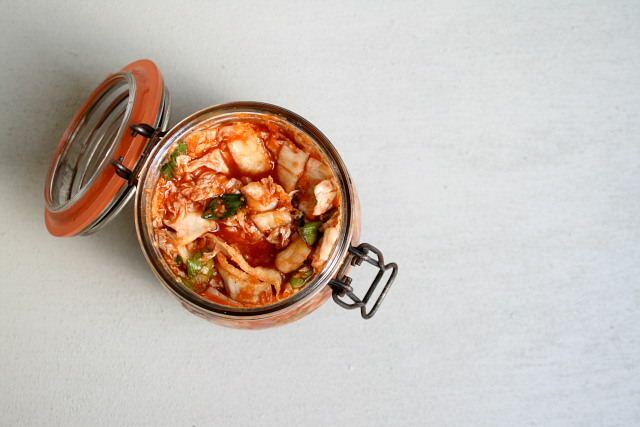 Pack the kimchi into a Kilner jar, and refrigerate for two weeks before using. At that point, fermentation will be well underway, and the taste and texture of the kimchi will have developed considerably. It will smell powerful and taste fizzy and prickly, and in my experience, has the power to scare small children. Eat your kimchi on its own, or use it as an ingredient in other dishes, such as soups or stir fry. Kimchi is excellent on hot dogs and burgers. I have just finished reading the Momofuku cookbook. Thanks for sharing your experience making kimchi for the first time. I’m glad you’re spreading the good word on Kimchi! Here in Tokyo we eat it a lot, since Korean food is all the rage right now. If you haven’t tried it yet, Kimchi is great in fried rice or in nabe (Japanese hot pot) with pork, more nappa cabbage and nira (I believe they’re called garlic chives in English). I always enjoy reading your blog! Keep up the good work!